Image Credit & Copyright: Velimir Popov & Emil Ivanov (IRIDA Observatory) Explanation: What causes the structure in Comet Lovejoy’s tail? Comet C/2014 Q2 (Lovejoy), which is currently at naked-eye brightness and near its brightest, has been showing an exquisitely detailed ion tail. As the name implies, the ion tail is made of ionized gas — gas energized by ultraviolet light from the Sun and pushed outward by the solar wind. The solar wind is quite structured and sculpted by the Sun’s complex and ever changing magnetic field. 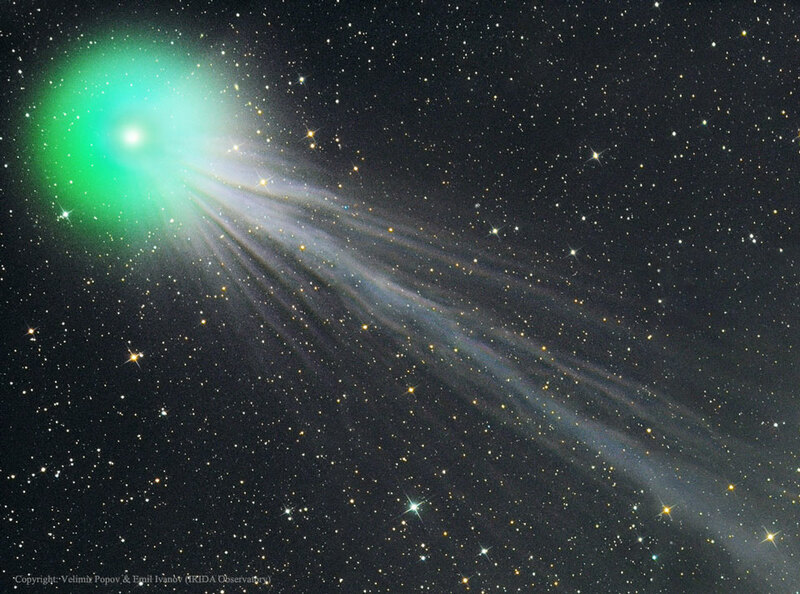 The effect of the variable solar wind combined with different gas jets venting from the comet’s nucleus accounts for the tail’s complex structure. Following the wind, structure in Comet Lovejoy’s tail can be seen to move outward from the Sun even alter its wavy appearance over time. The blue color of the ion tail is dominated by recombining carbon monoxide molecules, while the green color of of the coma surrounding the head of the comet is created mostly by a slight amount of recombining diatomic carbon molecules. The featured three-panel mosaic image was taken nine days ago from the IRIDA Observatory in Bulgaria. Comet Lovejoy made it closest pass to the Earth two weeks ago and will be at its closest to the Sun in about ten days. After that, the comet will fade as it heads back into the outer Solar System, to return only in about 8,000 years.the coma surrounding the head of the comet is created mostly by a slight amount of recombining diatomic carbon molecules. The featured three-panel mosaic image was taken nine days ago from the IRIDA Observatory in Bulgaria. Comet Lovejoy made it closest pass to the Earth two weeks ago and will be at its closest to the Sun in about ten days. After that, the comet will fade as it heads back into the outer Solar System, to return only in about 8,000 years.